Editor’s Note: We ran across this article on Packaging Europe’s website, promoting the use of the Infini® milk bottle made with food grade recycled HDPE. Food grade recycled HDPE is not currently used in milk bottle packaging in North America although FDA approved recycled HDPE is available in North America exclusively from Envision Plastics. Our food grade recycled HDPE is marketed under the brand name EcoPrime™ and is suitable for packaging a broad range of food products including water, juices, yogurt drinks, coffee, tea, dairy creamers, cereal, nutritionals, syrups, condiments and many other products. Embleton Hall Dairies, based in Wingate, County Durham are launching the new 2 litre infini® HDPE recyclable milk bottle following extensive market research. Designed by Nampak Plastics, one of the UK’s leading plastic milk bottle manufacturers, infini® is the innovative next-generation, eco-friendly bottle. Infini® has been designed to be lightweighted by up to 25% across the range without compromising strength, resulting in an initial weight reduction of 13% on the standard 2 litre bottle (33g vs 38g). Research has shown customers love its unique design and retailers love the combination of robustness and its environmental credentials. When placed in the door of a fridge the handle position makes it easier for the consumer to remove the infini® bottle. The bottles are made of HDPE (High Density Polyethylene) and recycled HDPE (rHDPE). Every infini bottle contains up to 15% rHDPE. This recycled content will increase further in the future with a target of up to 30% by 2015. HDPE plastic milk bottles are 100% recyclable and the consumer can recycle the infini® bottle in exactly the same way as a standard bottle. Also there is a carbon footprint saving over the standard bottle, resulting in approximately 75% of the research panel expressing their preference for the infini® bottle. The bottle achieved international industry recognition, picking up the top award in the ‘Best Dairy Packaging Innovation’ category at the Dairy Innovation Awards 2012, in addition to the World Packaging Organisation 2013 World Star Award. Commenting on their change to the bottle, Paul Thompson, director of Embleton Hall Dairies said: “The design of milk poly bottles has remained unchanged since we started back in 1984, so we were very interested when Nampak approached us with a new design, in response to growing customer requests for a more environmentally-friendly form of packaging. That it improves bottle strength and reduces leakage rates is a massive bonus, and the results are good for both our customers and the environment”. 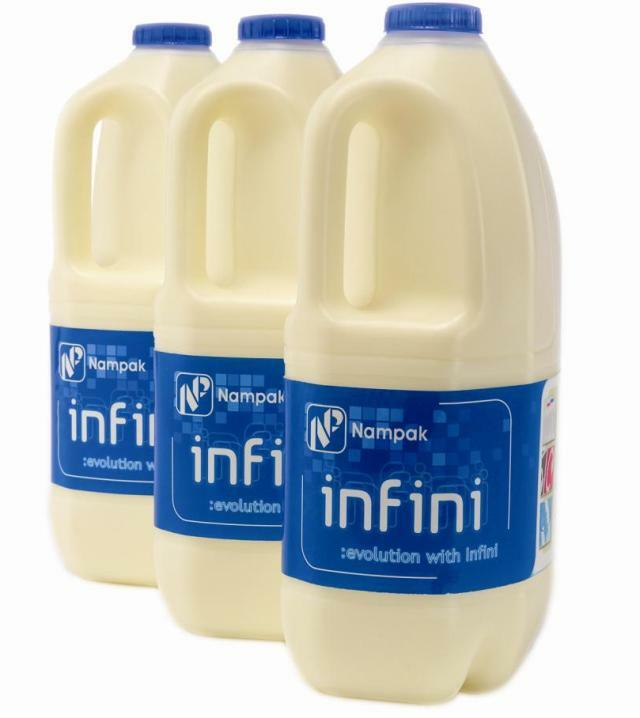 Carl Thorley of Nampak who worked with Embleton commented “Infini® is the result of a four year journey that my colleagues undertook in order to reduce the weight and carbon footprint of the standard milk bottle, but without compromising on its strength. It is ‘better by design’ and is playing an important role in helping the British dairy industry to meet its environmental targets and the support we have received from Embleton shows we are meeting the demands of the market.